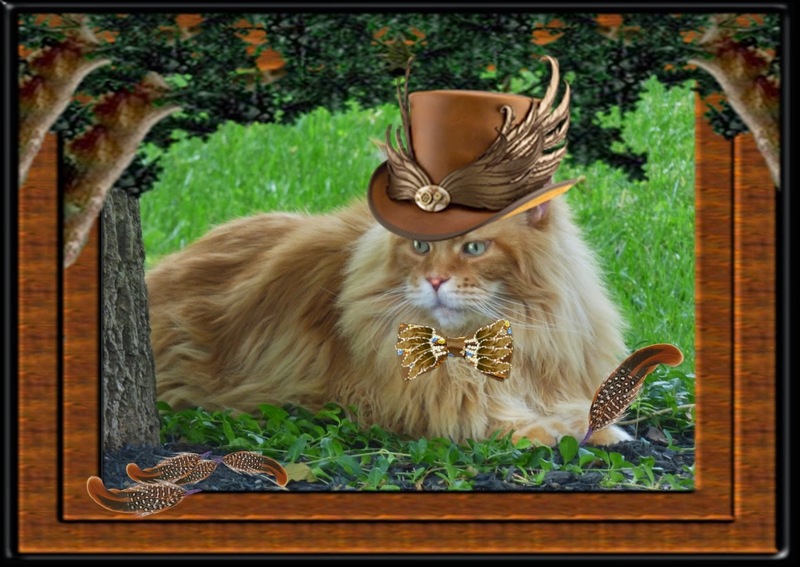 Wendy's 3-D Cats: 3-D MILLINERY MONDAY WITH FEATHERS IN THEIR CAPS! Today the 3-Ds have gone over the top with feathers! Domino's headdress is 100 purr cent feathers. 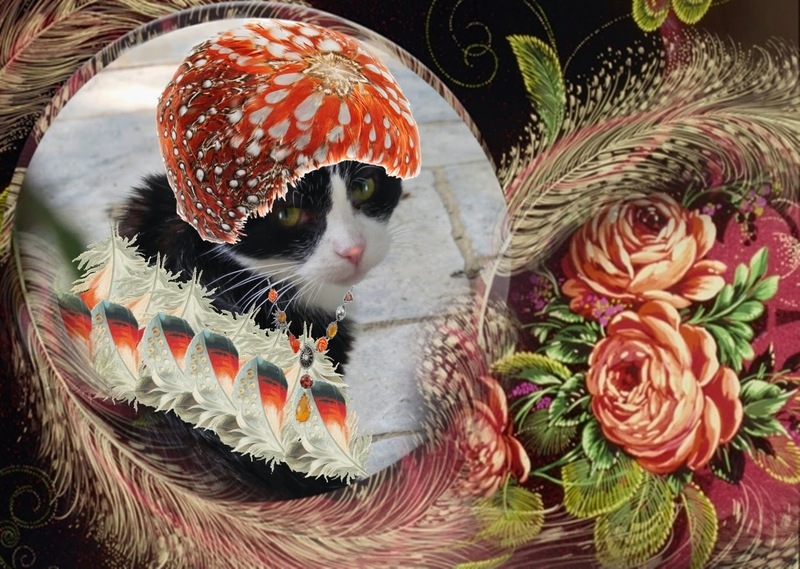 It is reminiscent of the Days of the FlapPURRS in the 1920s. She is also wearing a wrap made of both bright-and-light-coloured plumes. "Now dat I'm a flappurr, too, we birds of a feddah kin all flock off togeddah! ", she says. 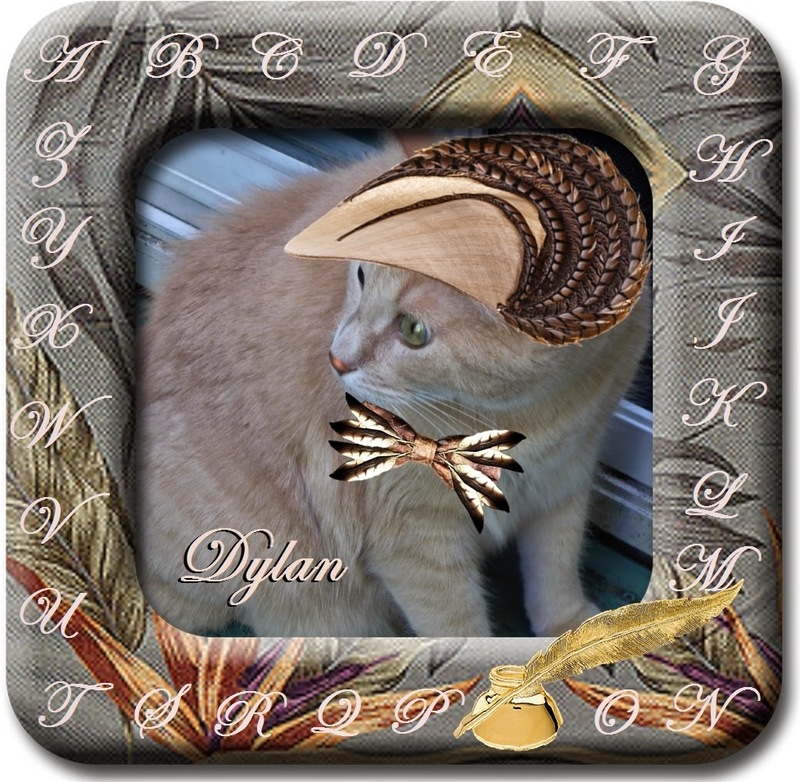 Dylan's sporting a stylish cap decorated with braided feathers, along with a coordinating feather tie in ivory and brown. Dylan has always wanted to do the 'write' thing, so he has been PURRactising with a quill pen and ink. He's done quite a good job, I think. "I is a mancat of lettahs!" he declares PURRoudly. "Hallelujah!" Dante's gone a little wingy sitting outside under the tree. His top hat looks like it could fly all by itself! Unlike his brother, Dante has no intention of using that quill in his paw as a writing implement. He's been busy plucking his supPURR! "All birds is eQUILL in my opinion", says Dante. "Is jus' a mattah of weddah dey're around in time fur breakfast, lunch or dinnah!"